In Uganda there’s no pension or state benefit to rely on. 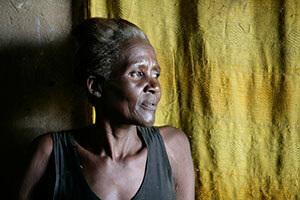 For most elderly people in Uganda, their family is their pension, supporting them in their old age. But AIDS and malaria have meant many of the elderly in Kabubbu don’t have that assurance – disease has killed their children leaving the grandparents to bring up their grandchildren. We even know of some grannies that have lost 11 of their 12 children from AIDS, malaria and wars. Quicken’s work now provides a safety net. In return, you will receive a photograph of your sponsored elderly person and – if they are able to write – occasional letters from the granny or granddad. Click here to find out how you can start sponsoring an elderly person. Adrian Butcher and his family began sponsoring two grandparents in 2008: Zaliya – an 84-year-old widow who lives with her sister; and Mathias – a widower in his 70s who has lived alone since his wife and son died nearly 40 years ago. 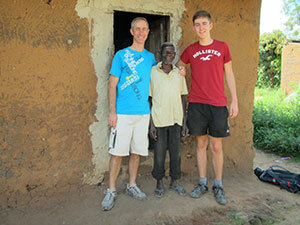 Adrian and his 17-year-old son, Matt, travelled to Kabubbu in 2012 and visited Mathias at his house.